Friends and residents enjoy the day at Sunrise Manor. The words Sunrise and daffodils were not indicative of the weather at Sunrise Village on the day of their annual Daffodil Tea. The streets surrounding Sunrise Village, a supportive living facility in Wetaskiwin, were slushy and lined with ice on March 2nd, 2014. 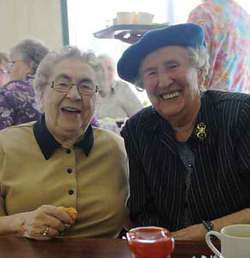 But that didn’t deter a steady stream of guests from joining the residents to enjoy a complimentary piece of lemon pie and a beverage at the annual Daffodil Tea. Upon entering the facility, guests were greeted by General Manager, Nicole Almost and other Sunrise Village staff and invited to choose and purchase from 100 fresh bunches of daffodils or 70 potted daffodils in support of the Canadian Cancer Society. The average age of residents at Sunrise is approximately 84 years but by observing them at the Tea, they are a very active group. Sunrise provides some basic needs like meals, housekeeping services and basic nursing providing the residents with the time, energy and independence to do what they want in the community. The 92 suites in the Village are almost always filled with approximately 100 residents. There was only one vacant suite at the time of writing. All areas in the Village have been designed with “ease of use” in mind. The 9 year old facility offers residents a number of well-appointed amenity areas including an 80 seat dining room, large activity room with a shuffleboard and billiard table, hair styling salon, tea room for private family dining, cozy library and fireplace lounge, spa room and much more. Almost has only been with Sunrise Village since February, 2014 but has established that, “The staff are phenomenal and the residents are so friendly and considerate.” Given the happy expressions of the residents of Sunrise Village the Daffodil Tea was a special day where they were enjoyed having the opportunity to entertain family, friends and acquaintances in their ‘home’. There may come a time when living at home is no longer a safe option for you. Your Home Care team may recommend a supportive living community as the right living option. Supportive living provides the care you need and the independence you want. You may move to enhanced living, designated assisted living, or a personal care home – all these supportive living communities are family-friendly, home-like environments that assist you in living as independently as your abilities will allow, as close to home as possible. Your privacy and lifestyle choices will be respected, and you’ll have the security and peace-of-mind that comes from having on-site staff 24 hours a day. In order to access supportive living, available to seniors and to adults with developmental disabilities or chronic illnesses such as Multiple Sclerosis, you need to be assessed by a Home Care Registered Nurse. Is Wildrose the Future for Alberta?